Anthropology has taken, what seems to be, an inadvertent back seat to the other social sciences. The “soft” sciences, as they have often been called, began their assent into academia with the burgeoning of the Enlightenment. They ploddingly evolved through the mid 1800's; incorporating the more entrenched scholarly pursuits into their methodology. Literary studies, which at the time included historiographies, were mined and harvested to imbue the social sciences with the impression of both brevity and an established academic legacy. Couple this with philology, etymology and a general level of appreciation for the cultural, political and social histories of Classical Greece or Rome and the social sciences were off to a running start. Two of the emerging fields of cultural studies were sociology and anthropology. They are often confused as near synonyms of each other, which leads to a misunderstanding of their core pursuits. This confusion has led to the amalgamation of their meanings and has gradually ushered a death knoll of sorts for the prosaic application of anthropological theory on modern society. What do we make of the apparent semantic differences between the two sister disciplines of cultural studies: sociology and anthropology? Moreover, how can we salvage the waning importance of anthropological analysis? In a broad sense anthropology encompasses a study of all characteristics of human societies, including social relationships and evolutionary origins. The focus of anthropology is generally concerned with small groups in a homogenous historical context. Anthropology delves into the folkways, mores and myths insofar as they influence and shape social and cultural structures. Creation myths and cosmologies are the bread and butter of anthropology. Sociology, on the other hand, focuses on larger macroscopic social relationships which tend to involve economics and psychology. The intertwining of 2 or more social sciences within a sociological paradigm allows for a greater frequency of use among academics and journalists. By default anthropology attempts to clarify and describe the underpinnings of a societal framework. Furthermore, it employs those underpinnings to illustrate how cultural institutions are governed. Sociology enumerates the cultural institutions and their formation but with a narrower foundation. What follows is an attempt put anthropology back on the roadmap of relevance by applying it's cultural diagnostic tools. This exploration will hopefully peel back the layers of the the revolving door policy underpinnings in modern politics. The revolving door policy is the Godhead of a closed circuit, almost plutocratic system by which professionals meander in and out of public service after intermittent appointments either as lobbyists, think tank policy wonks or as CEO's of banks and multinationals. The Godhead of the revolving door policy is, of course, not limited to the exemplars last mentioned. There are many different permutations of the 3 points on the triangle but one steadfast position is that of government. Fundamentally, the revolving door policy is about gift giving, homage and relationship building. From the seminal theoretical work done by Marcel Mauss in his early 20th century book “The Gift”, it will become clear how similar the mechanics of the (chief) “Big Man” in primitive-preliterate society and modern day revolving door “Big Men” truly are. Marcel Mauss was the nephew to one of the pillars of anthropology, the Frenchman Emile Durkheim. Mauss' book, "The Gift", chronicles how human relationships are developed, solidified and sustained through mutual gift-giving. This form of gift-giving, where the recipient and the benefactor gain no material or monetary advantage from the artifacts which are bestowed, is referred to as “mutual reciprocity” in anthropological jargon. Mauss employed in his study a cross-cultural methodology, noting gift-giving practices of Polynesians, Northwest Native Americans and Melanesians. European feudal society has a striking resemblance to this mutual reciprocity, albeit the Lord wielded a sovereign hegemony over the power structure which was not the case in preliterate egalitarian societies. The analogy is, however, still valid. Through a prism of a somewhat romanticized nostalgia, the feudal state indentured the serfs to toil and harvest the Lords estates. The Lord would excise a tax on a portion of the serfs harvest and in exchange the Lord would pledge to defend the serfs in the event of an attack from interlopers. Harkening back to the French Ancien Regime of the 15th through the 18th centuries, one can observe a classic example of primitive relationship building. The social sciences deem this type of asymmetrical relationship building clientelism. Clientelism at its core is an exchange of goods, services or tribute for political or social support. Imbedded in the clientelism is an explicit or implicit mandate of quid-pro-quo. Again, in preliterate societies the egalitarian balance precludes an explicit asymmetry. A term which is often used incorrectly as a synonym for clientelism is cronyism. 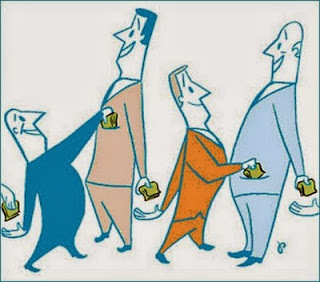 Cronyism shares the tendency of gift-giving but differs from clientelism in the degree it skews the symmetrical balance of the relationships. Cronyism is a tendency to promote friends, family and other semi-familial relationships through the ranks of political or governmental office. These people often are appointed to their positions of authority, regardless of their qualifications. As in the Ancien Regime, the French were well aware of the political benefits of cronyism. So much so they coined the term which we most use today when referring to cronyism: nepotism. It is derived from the French word for nephew and should be nothing new to those familiar with Renaissance politics. Machiavelli's magnum opus, “The Prince”, was based on Cesare Borgia of the notorious Borgia family. Cesare's father/uncle, Pope Alexander VI , was the second true patriarch and architect of this politically savvy dynasty. He was the “nephew” to Pope Callixtus III, who launched the dynasty in the 15th century. Nevertheless, the exploits of Cesare's tutelage under his father are the bedrock of the infamous credo: “the ends justifies the means.” Cronyism is by design an asymmetrical relationship. The patron or the bestower of the “gift” (position) can requisition a heavier loyalty tax from the recipient because the bestower commands greater clout in the particular political system. Returning to our original premise; what can anthropology bring to light about gift-giving as way of promoting and solidifying relationships within the Godhead of the revolving door policy? The crux of the analysis lies with an incorporation of the two principles of relationship building through gift-giving: clientelism and cronyism. These two are melded into a closed circuit of mutual reciprocity on a small intimate participant scale. In the short term, the bestower gains a small advantage within the quid-pro-quo balance. However, as the players float effortlessly from commercial appointments to governmental positions and back again in that closed loop, the gains and losses are mutually shared. The “gift” is shared through the tributes which are paid to the various institutions either in valuta or in kind. The bestower's prestige or influence is bolstered by the gift and allows him/her to subsequently bolster the prestige or influence of the recipient. In this way gift-giving to a “Big Man” in preliterate societies is not that dissimilar to gift-giving to an “ex-politician” or “ex-banker” in modern Western society. ENDA: Why LGBT's and Straights Should Care.